If you love watching shore birds, you'll love this pillow! The pillow is covered with sandpipers looking for food in the marsh. 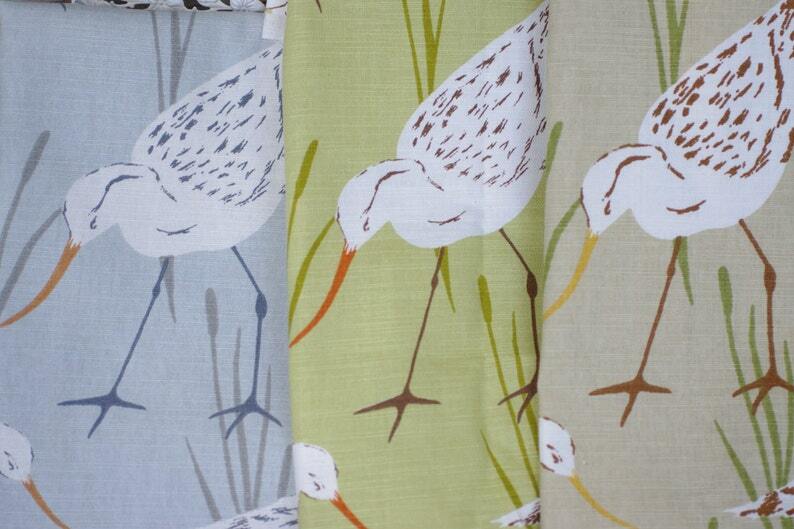 I was immediately drawn to the sandpiper print of the birds with their orange peaks. This pillow has a great texture with a blend of cotton and linen. A lovely pillow for any home, coastal or not. Decorate your cottage in style. All pillows are handmade by me. Fabric available in gray (shown), green or tan background. Love my sanddollar bracelet! And I love that it is sized to fit. The jewelry artist is very talented!! Stunning bracelet! The double starfish is beautifully made. I have received many compliments. This is a great Etsy shop! Payment must be received within 48 hours of purchase or the transaction will be canceled. Our goal is to provide a great shopping experience for you. If for any reason you are not satisfied with your purchase, please let us know as soon as possible. You can connect with us through convo communication or email. Please use the method you are most comfortable with. •	Buyer is refunded the price of the item minus original shipping charge. •	Buyer will be responsible for all shipping charges. Shipping is non-refundable. •	Item must be in resale-able condition, otherwise refund amount will be at the sole discretion of By The Seashore. •	There are no refunds or exchanges on custom orders. Wholesale order returns are at the sole discretion of By The Seashore. A 15% restocking fee will apply to all allowed returns on wholesale and allowed return and cancellation of custom orders. •	Tshirts are not refundable once worn or washed. • Your order will ship to the address you provide during checkout on Etsy, not to your billing or PayPal address. • Most orders are shipped within 5-10 business days. For custom orders, a time frame will be provided. • Shipping method will be determined by the weight, size, and destination of your package. Please review each item for specific shipping costs. • To ensure complete protection for your purchase, package insurance is available for an additional fee; ($0-100--$2.25), ($100-200--$2.75), ($200-300--$4.70). By The Seashore is not responsible for items damaged during shipping. We will make every effort to work with each customer if a problem with their order arises. •	Most orders will ship by priority mail and include a tracking number. •	You will receive an email notification including tracking number, link to USPS tracking, date shipped and address where purchase has shipped. •	We make every effort to ship in a timely manner as outlined above. We are not responsible for delays in the shipping service provided by the USPS. It is rare, but occasionally packages are routed to the wrong sorting facility. •	We ship to all international locations. •	All other services will require an additional charge, including but not limited to, registration and insurance. •	Customs forms will be marked as merchandise, so please be prepared to pay any taxes or duties your country may levy. • Many of our items, like our sea life bottles, require special handling & packaging. • When removing bottle artwork from packaging, handle by bottle and avoid shell contact with side of box. • Styrofoam, if we use any Styrofoam, it is from recycled or repurposed sources. • Bubble wrap-we make every effort to reuse from sources that would have otherwise added to the waste stream. There are times when we have to purchase this product.